FLORAMIATA has an important history which interweaves with the social and geological characteristics of the Mount Amiata territory. The company was created to employ the ex-miners who extracted cinnabar from the bowels of the ancient volcano, using the geothermal energy naturally produced in the subsoil to heat the greenhouses. A virtuous project, economically and ecologically sustainable, which looks at the future basing its production on innovative methods, clean energy and passion of its workers. The short, through the statements of ex-miners, technicians and the fascinating images of mining sites and greenhouses, traces the history of Val d’Orcia area where, at the beginning of the last century, an economic revival occurred thanks to cinnabar extraction and mercury distillation; afterwards unfortunately, it was discovered that said mineral activity caused an unacceptable impact on the environment and health. Hence the closing of the mines and the ideation of projects to use the same geothermal steam that originated the metalliferous deposits, to produce electric and thermal energy that still heats 23 hectares of greenhouses where delicate and distinctive cultivations of ornamental plants grow; a successful company that has offered work to ex-miners and new development opportunities for the entire valley. The National Park of the Amiata Mines extends in the countryside neighbouring the town of Abbadia San Salvatore, territory in which for about a century, from 1870 to 1970, the subsoil was excavated to extract cinnabar, the sulphide from which mercury was obtained. The mineral district of Amiata, is one of the most important in the world, it counts 12 mines and more than 50 research areas. For some time, the mines of Mount Amiata produced 50% of the entire world production of mercury, remaining however, the first suppliers for several decades, thus surpassing the production volumes of Almaden in Spain. In the ’70s, a world-wide mercury crisis started, caused mainly by the toxicity of the mineral, and the arrival on the scene of new producers of developing countries able to apply competitive prices. Due to these difficulties the entire mercury basin of Mount Amiata, including the Abbadia San Salvatore mine, ceased its activity in 1972. 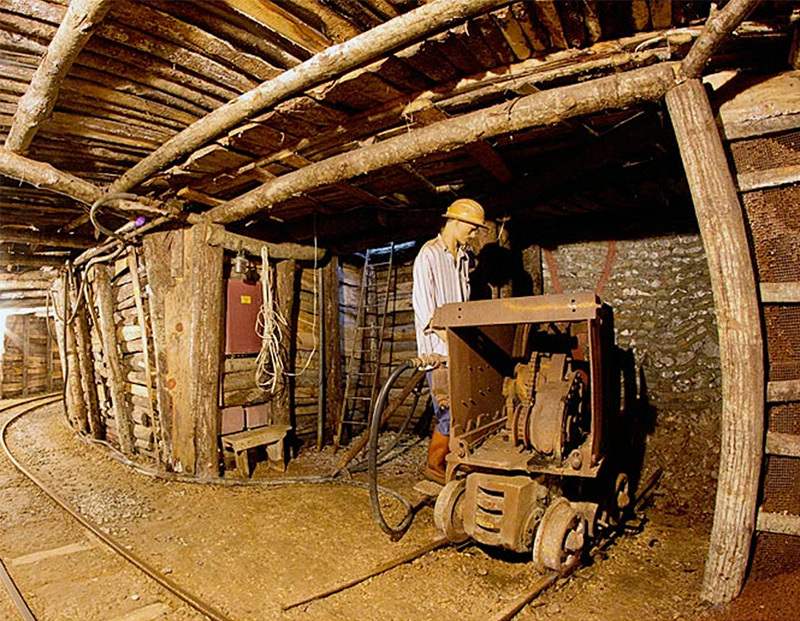 Established in 2002, the “National Museum of the Mines of Amiata”, that apart from making it safe, the recovery of manufactured goods, and environmental protection of the mining sites, has the important task of preserving the historical memories of these places as well as the tourism valorisation of the Park territory. Amiata offers many very hot thermal water springs (from 37° to 45°C), result of the residual volcanic activity that continues inside the mountain. 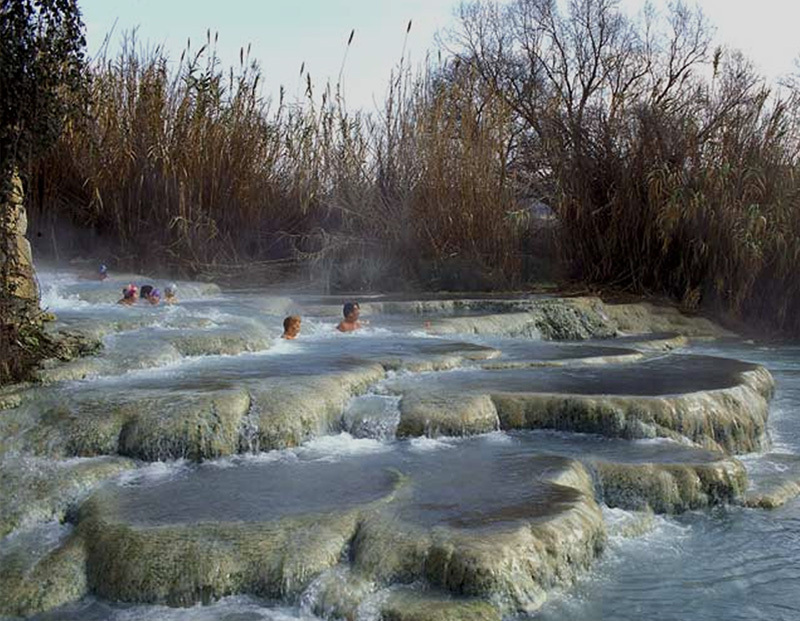 These thermal waters, rich in sulphur and other curative elements, still flow near almost every village, from Bagni San Filippo, to Bagno Vignoni, from Santa Fiora to Saturnia. Each of these villages has developed a thermal water collection system allowing the creation of modern wellness centres, with swimming pools, saunas, salt-massage and so on; or, for adventure enthusiasts, there are still many springs, in the woods or in the open countryside, where nothing has changed in thousands of years.